Nathan Michael Corzine is an instructor in history at Coastal Carolina Community College. 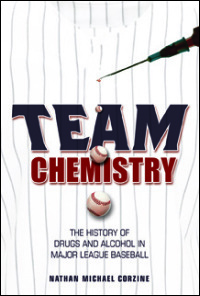 He recently answered some questions about his book Team Chemistry: The History of Drugs and Alcohol in Major League Baseball. Q: Are there any surprises when it comes to the examination of drug use in Major League Baseball? Is it somehow more common for ballplayers than other types of lines of work? Nathan Michael Corzine: Yes, there are always some surprises. Of course, the initial surprise – although this is fairly well known now – is the way some older players, long retired, admit that had they been given the opportunity to use modern performance enhancers, they would have done so. I think it speaks to the eternal athletic search for an “edge” (or perhaps, in our high-pressure modern sports, something to take the “edge” off) that is part of not only professional sports, but a great many professions far from the playing field. That said, I don’t think it is necessarily more common for ballplayers. I suspect, and most numbers that I’ve seen, would suggest that ballplayers use/abuse drugs at about the same rate as society more broadly. Today the debate centers on drugs like Adderall, ephedrine (used to deal with asthmatic problems), and other mainstream drugs used by a diverse range of people – students cramming for a test, tired office clerks, Wall Street stock jobbers, and athletes from the amateur ranks to the professional. Q: Many people know that ballplayers have been known to indulge in substance abuse throughout the game’s history; the hard-partying tales of Babe Ruth come to mind. But how far back does the use of drugs for performance enhancing purposes go back in baseball’s history? Corzine: I think, to some degree, it probably goes back to the beginning of, at least, the professional game. Considering that the notion of performance enhancement is as old as sport. Think of the Greeks and Romans ingesting “horn powder.” It was common in many popular sports of the 19th century (cycling), and we know pitcher Pud Galvin experimented with a famous testosterone cocktail, we can probably be sure that baseball, even in the beginning, was not immune to the temptation of artificial enhancement. The intention to enhance performance (by any means necessary) was certainly there, misguided though it might have been. Consider the stories of Pete Browning, or Mickey Welch, and a host of others, who that thought their alcoholic intake would enhance their performance (or was actually required to perform at all). The more contemporary example of Josh Hamilton suggests the pervasive sense that tobacco use was also part and parcel of performance – when a player quit using, his performance dropped. Q: Was there an era when did cocaine became more common in MLB club houses? Corzine: Much like the broader culture the game reflects, the cocaine blizzard swept into clubhouses in the 1970s. That is when the foundations of a broad, troubling, network of acquisition, use, and abuse became linked to the game. All of the signs, and frankly most of the knowledge about cocaine, were there well before the attitudinal shifts in the 1980s when broader governmental awareness and increased focus on the problem coincided with the exposure of the sports world’s connections to the drug.